“Before the 1990s fashion week didn’t mean anything to anyone,” says fashion photographer Guy Marineau. That may come as somewhat of a surprise if you have experienced what is now the fashion week norm: a narrow, Parisian street outside a show, swollen with editors and Ubers, street-style photographers and their subjects, who linger with intent, smoking with a studied aloofness. This exact scene is re-enacted multiple times throughout the week, roughly four times a year per fashion capital, in what is perhaps emblematic of an increasingly chaotic, ever-expanding industry. It was during this pre-internet, pre-street-style era that Guy Marineau first began to document fashion week, unwittingly creating a template for much that we now take for granted. In 1979, Life magazine commissioned the Frenchman to document what fashion week’s attendees were wearing – before anyone had ever heard of the term “street style”. As part of the same assignment, Marineau went backstage at Valentino and Yves Saint Laurent to snap candid shots of models. It was in that same year that he also began taking up a position at the end of the runway (his colleagues had typically shot whilst sat in the front row), in turn, pioneering the style of full-length, straight-on catwalk photos that have since become the industry standard. Despite a career that included political reportage in Israel and Northern Ireland during The Troubles, it is his images from the world of fashion that Marineau is best known for. It is a body of work that not only includes a host of conventional yet stunning fashion images, but also a slew of intimate portraits of some of fashion’s most revered designers, from Hubert de Givenchy to Yves Saint Laurent at his Moroccan home. Now 70, Marineau has since stepped away from the industry but has recently begun to publish his vast body of work online, giving a fascinating glimpse into what fashion week once was. Here, we speak to the French photographer about documenting street-style in 1979, working with Saint Laurent, and why he believes digital cameras killed the charm of fashion photography. Tell me about your 1979 ‘street style’ images for Life magazine. Was this an unusual assignment at the time? Guy Marineau: The years between 1975 and 1985 were probably one of the richest decades for creation, fashion and fashion photography in Paris. I really loved that time when it was easy to envision your future memories and almost all the time ideas came from the street, the street was a source of inspiration. Every other week I’d get a fax from New York or John Fairchild (then editor in chief of Women’s Wear Daily) asking me for snapshots of people in the street. I’d take my Nikon and set up camp in Saint-Germain des Prés, in front of Lipp, Le Flore or Les Deux Magots and I’d photograph every interesting or original look I’d see. A bit later, I found out that my colleague Bill Cunningham was doing the same in New York for the New York Times. As for Life magazine, what they wanted was a bit more surprising given their usual topics, but Judy Fayard, who was the editor of the Paris office, had vastly anticipated the development of the ready-to-wear trend in Paris fashion shows and the same emerging trend in Milan. Parisian couture was no longer the only player in the field. In the same series of photos, you also document backstage scenes at Valentino, Saint Laurent etc… Can you describe what the mood was like backstage at these shows? Guy Marineau: The atmosphere in 1980s fashion shows was completely different from today. Paris was a source of inspiration, it was a free, wild city without any real competition at the time. Backstage, there weren’t many people around, just models, the designer’s team, the dresser, prop masters, two or three hairdressers, very few make-up artists – girls would generally do their own make-up. There was much more freedom than now. It was an era of unaffected, relaxed, happy and rather good-looking young women who would go and have lunch with us between two fashion shows. They were far from the unhealthy-looking models of today. Backstage, models would read literature while waiting for the show to begin, but today it’s been replaced by selfies. Taking your own picture by yourself or with others has become a way of life. But who am I to judge? Your work in fashion photography has spanned several decades. What are the main changes you have noticed? Guy Marineau: Before the 1990s, ‘Fashion Week’ didn’t mean anything to anyone. Professionals and fashion cognoscenti would attend the shows without knowing much. Unless they carefully read women’s magazines, they’d only notice events on the scale of Christian Dior’s New Look. Today, many people have unwittingly become fashion experts. But is it normal that fashion should change so often? Which country in the world today doesn’t have a Fashion Week? Can it be said that fashion is a form of art reflecting both a specific time and society? Guy Marineau: Fashion photography became a job in the mid-1970s when houses like Saint Laurent and Calvin Klein decided to turn these presentations into a bigger event to advertise their fragrances. Now, it’s still about sales, but, for me, the charm is gone. In 2001, I went digital, trying to blend fashion, art and technology – I’m not sure I managed it. I used to see fashion as a large playground where you could experience the highest stress or the biggest joys. But it also was a unique and authentic opportunity to express who you are. You worked extensively with Yves Saint Laurent. Can you tell me about the relationship between you and him? Guy Marineau: I had this fascination, admiration and the deepest respect for Monsieur Saint Laurent. Of all the great fashion designers, he is the one I spent the most time with, and who was the most loyal to me. 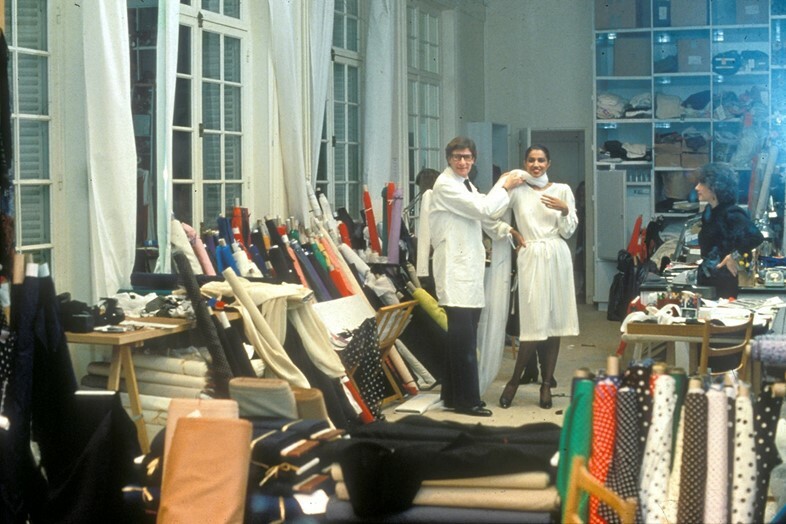 I first met Yves Saint Laurent in September 1975, during my first previews for WWD, in his office on Avenue Marceau. I didn’t know then he had just split from Pierre Bergé and that they were in conflict. I thought this man was very touching, shy and reserved. The large entertaining room was often steeped in deep silence as we would wait for his so soft and singular voice to emerge from his tall silhouette, and give us details, precisions about the dress or the piece, worn by Kirat or Mounia, that he had chosen for me to photograph. I adored the man, even though he was a complex character. I loved his work, his vision in dressing women’s bodies, giving them colours according to seasons. I loved the freedom in those bustier dresses, interlaced straps in the back, his light touch and his precision, the flowing femininity in wide skirts, this notion of urban sexiness, with an emphasis on short-cuts, but that included drapes and the colours of Marrakech at sunset. I was a ‘woman-loving’ man and for me, monsieur Saint Laurent possessed the talent to make them naturally beautiful and it became a pleasure to take their photograph. On your website, you claim to have pioneered the technique that is now industry-standard for runway shots. When did you first start shooting like this? Guy Marineau: Yes, I can claim with pride that I was the first to take a step back during fashion shows and leave the edge of the catwalk. It was in 1977, I just couldn’t stand anymore sitting down on the front row next to Mr Fairchild and shooting with a flash and a 35 or 50mm lens that distorted the shape of the clothes and the model, giving them a longer silhouette and a tiny face. So after a while, I began to take my place at the end of the runway, standing up, facing the models with two Nikon F2 bodies, at their eye level. When the model would get on the catwalk, I’d shoot a first series in black and white, take my other camera and shoot another series in colour. I had to choose the right light, the right diaphragm, focus (there was no autofocus back then), all at the same time. It was rather complex but I managed to make it work every time. Your website also says that you think digital photography has “killed the profession” – Can you explain what you mean by this? Guy Marineau: Back then every magazine, every paper, every press agency had their own photographer. So each of them had original images, a different angle, a different light, a different shot. In the 1980s, there were about 350 of us, photographers approved by the Chambre Syndicale. Today there’s only about fifteen. Now all the magazines and websites all use the same pictures – bland, processed, edited images. That means Vogue France can contain the same photos as Elle Germany, Brazilian Bazaar or Chinese Marie-Claire. Fashion show photographs have become just like everything else – globalised. But that has repercussions on employment. In my day, I employed three assistants, a driver, a delivery man, the personnel of a laboratory that operated 24/7. All these kinds of people have lost their jobs. Isn’t there also merits to advances in technology, and having the ability to create images that wouldn’t have previously been possible? Guy Marineau: No, for me, there’s no merit in it anymore, because it’s no longer photography, it’s informatics. Post-production has become more important than the shooting itself. Photography, photos-graphos in Greek, means “writing with light”. Software takes this ability away from you. You can be a very bad photographer and a good Photoshop user, so you’ll still deliver images. It’s become too simple, too easy. How accessible were the designers of the 80s in comparison to today? Guy Marineau: In general, all the designers I met were very accessible and spoke freely about their collections with the journalists. There is only one of which not many people know the face of and who has always refused to be photographed, Martin Margiela. One season, with Dan Lecca, another photographer, we decided to call on Mr Margiela after a catastrophic fashion show in Paris. Backstage we spoke for fifteen minutes to a character we were introduced to as Margiela – we later discovered that he was one of his assistants. When Christian Lacroix was interviewed, he spoke and defended the house he had created and which bore his name. The same goes for Givenchy, Ungaro, Valentino or Yves Saint Laurent – they had things to say and a vision to defend. In 2017, almost every year it’s like musical chairs with designers within the big houses of couture so I understand that for a young designer it is difficult to be sincere. Do you still pay attention to fashion now that you no longer work within the industry? Guy Marineau: I’ve browsed websites and read magazines out of curiosity and I’ve seen the idea of ‘creation’ change and designers disappear one after the other. I mean real designers, those who have created their own house and made a name for themselves in the whole world because they had things to say, they were incredibly talented and they loved what they did. I’m not talking about these people today who go through school and get hired for a large sum of money by established houses that have lost their founder, and who work with dozens of assistants, taking up and transforming “vintage sketches” found in the archives. There’s nothing exciting anymore in today’s presentations. They used to last 35 or 40 minutes, the girls had an elegant stride, they were allowed to smile, to turn, to give life to the clothes they were wearing and we, hidden behind our 300 mm lens, we had the time, even if it was short, to make beautiful images, original, different and varied.